SALE!! Only $9.99 for any coat - any size. 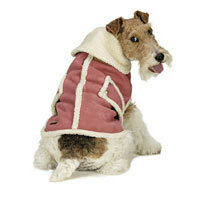 This shearling coat brings fashion & function to all canines. The faux suede coat is fully lined with sherpa fleece and a wide sherpa collar, keeping your dog warm and cozy.